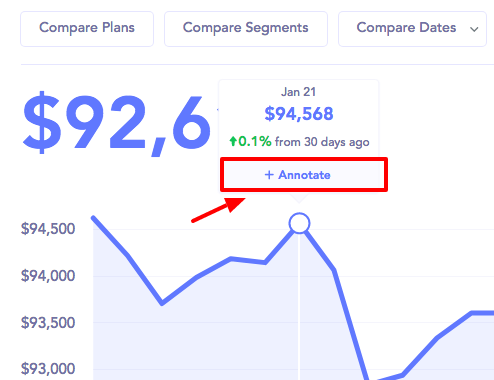 Adding an annotation to a graph is like writing a note on the margin of a book. You can use them to note important changes to your businesses. Things like new features, media coverage, churn reduction efforts, and marketing campaigns. Anyone can add an annotation. Standard users can add and deleted their own annotations, while admin users can delete any annotation. How do I set up annotations? 1. Hover over any point on the graph and choose "Annotate"
2. Type in your annotation. 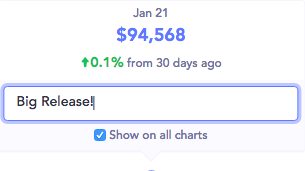 You can also choose whether to show it on all graphs, or just this graph. 3. 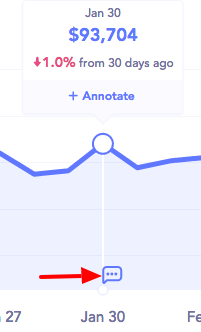 You can show an annotation by clicking on the icon at the bottom of the graph. ...Or by clicking on the Annotation icon in the toolbar.